New dentists who may not have a lot of time but are interested in getting more involved with the ADA may want to consider joining a dental standards working group. The American National Standards Institute, or ANSI, accredits the ADA to develop dental standards and technical reports for products and information technology used by the dental profession and consumers. The bottom line: these standards and reports help ensure safety and quality for providers and for patients. 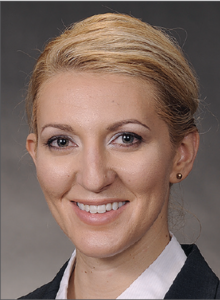 Dr. Brittany Kurzweg, a 2011 University of Florida College of Dentistry graduate, joined a standards working group last year after her research was recognized with the 2017 Robert H. Ahlstrom New Investigator Award for Dental Informatics. This annual award from the ADA is designed to encourage dentists and dental students to conduct standards-based research and participate in standards development. Dr. Kurzweg, a Lieutenant Commander in the Navy Dental Corps who graduated last year with a master’s degree in oral and maxillofacial radiology from The University of North Carolina at Chapel Hill School of Dentistry, said any dentist has the expertise to be valuable participant in standards development. “Working groups need all levels of experience to develop standards and technical reports that will have maximum impact across the dental community and, especially in the case of technical reports, are written in a way in which new dentists can appreciate,” she said. Topics of standards and technical reports vary widely and include subjects like secure electronic communication of health information, oral rinses and pit and fissure sealants. Participants choose the topic areas that are of interest to them. Volunteers review and comment on draft standards electronically; in-person meetings are not required. Standards can take one to three years to complete and there are often several reviews required during this development period. Currently, there are more than 100 national standards and more are under development. Development of standards is an often-overlooked ADA member benefit. “The ADA’s Standards Program establishes how dental products and technologies are made both in the United States and internationally,” said Dr. Kurzweg. Volunteering can be rewarding, she said. For more information on participating in ADA standards committee working groups, visit ADA.org/dentalstandards.